The flyweight belt is on the line. In 2018 the UFC crowned two champ-champs, as Daniel Cormier and Amanda Nunes each moved up a weight class and claimed a second belt. On January 19, 135-pound king T.J. Dillashaw will move down in weight to challenge Henry Cejudo for the flyweight title. 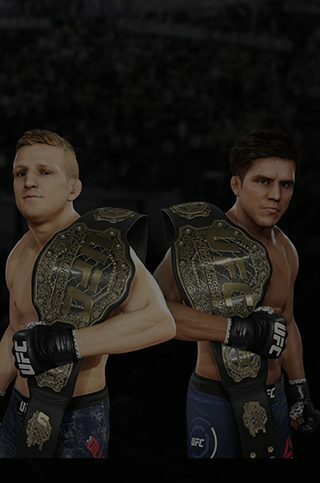 This is the first time a UFC fighter will move down in weight for a shot at becoming a simultaneous two-division champion, and with all this excitement, we're previewing the action in UFC 3. Find the video below, and make sure you play the contest before the main event. With two such evenly-matched competitors, this is a fight that you'll want to explore first in UFC 3. An Olympic-caliber wrestler, 125-pound champ Henry Cejudo holds a slight grappling advantage over his opponent. While Dillashaw has the advantages in striking, stamina, and health ratings, these can be negated by the powerful wrestling that Cejudo possesses. If you're defending the belt as Cejudo, threats like Dillashaw's superior striking can be neutralized by taking command of the fight with wrestling, as Cejudo will be able to sap Dillashaw's energy and take some power out of his shots. If you're playing as Dillashaw, then you'll want to avoid being caught in dangerous grappling positions as you look to finish the fight from your feet with one of the game's best strikers. Stay within striking range and put Dillashaw's excellent movement to work, and avoid getting in too close on Cejudo, as he will likely go to the clinch at this range. Dillashaw's advantages in striking and health will be most apparent if you can maintain his energy over the course of the fight – it's your best chance at walking away a champ-champ as Dillashaw. Both fighters bring a well-rounded game to the table, so make sure you check out these striking and grappling tips to help round out your arsenal. Get your digital copy of UFC 3 for up to 65% off from January 15 to 21, 2019.